The brilliance of Charlie Parker. Arista Records, a relatively new company that helps mind the avant-garde, has recently purchased the invaluable Savoy Records catalogue, and its first reissue is “Charles Christopher Parker, Jr.: Bird / The Savoy Recordings” (Savoy SJL 2201). The album includes the original masters of the thirty sides Parker recorded for Savoy between 1944 and 1948 (alternate takes, issued in a hopeless stew years ago, will be unscrambled for subsequent Arista reissues), and among them are the first small-band records he made (“Tiny’s Tempo,” “Red Cross,” “Romance Without Finance,” “I’ll Always Love You Just the Same”), all under the name of the guitarist Tiny Grimes, as well as the first, and still classic, numbers done under his own name (“Billie’s Bounce,” “Now’s the Time,” “Ko Ko,” “Thriving on a Riff,” “Warming Up a Riff,” and “Meandering”). Such later and equally imperishable efforts as “Parker’s Mood,” “Donna Lee,” “Barbados,” and “Blue Bird” are also present. The rest of the material tends to be uneven. Parker plays pale tenor saxophone on several tracks, and his accompanists, who generally include Miles Davis, John Lewis or Duke Jordan, a variety of bassists, and Max Roach, are sometimes leagues behind. Davis is dull, Lewis and Jordan don’t quite have themselves together yet, and the ensembles are smudged. But, by and large, Parker is fresh and searching, and the album serves as a singular reminder that Parker, who died at the age of thirty-four, in 1955, was one of the wonders of twentieth-century music. Like his spiritual brother Dylan Thomas, who died a year or so earlier, Parker was labyrinthine. He was a tragic figure who helplessly consumed himself, and at the same time he was a demon who presided gleefully over the wreckage of his life. He was an original and fertile musician who had reached the edge of self-parody. He was an irresistibly attractive man who bit almost every hand that fed him. He lived outside convention (he probably never voted or paid an income tax), yet, though totally apolitical, he presaged, in his drives and fierce independence, the coming of Malcolm X and Eldridge Cleaver. And he was, albeit succored by a cult, largely unknown during his life. Parker was born in Kansas City, Kansas, to a knockabout vaudevillian, Charles Parker, and a local girl, Addie Boyley. When he was seven or eight, his parents moved to Kansas City, Missouri, and when he was eleven, his father, who had become a Pullman chef, disappeared from his life. Grammar school went well, but after he had spent three years in high school as a freshman he dropped out, and by the time he was sixteen his life was already accelerating dangerously. He had got married and had a child, he had become a professional, self-taught alto saxophonist, he was a member of the musicians’ union, he was a neophyte fixture of the teeming Kansas City night world, and he had begun using drugs. When he was eighteen, he went to Chicago and then to New York, where he became a dishwasher in a Harlem restaurant and fell under the sway of its pianist, Art Tatum. He also played in a taxi-dance-hall band, and jammed tentatively around Harlem. In 1940, he joined Jay McShann’s Kansas City band. In his biography of Parker, “Bird Lives! The High Life and Hard Times of Charlie (Yardbird) Parker,” Ross Russell notes the effect that McShann’s radio broadcasts from the Savoy Ballroom had on John Lewis, then a student at the University of New Mexico: “The alto solos on those broadcasts opened up a whole new world of music for me. I’d known Jay McShann from the time he used to barnstorm in the Southwest . . . but the alto saxophone was new and years ahead of anybody in jazz. He was into a whole new system of sound and time. 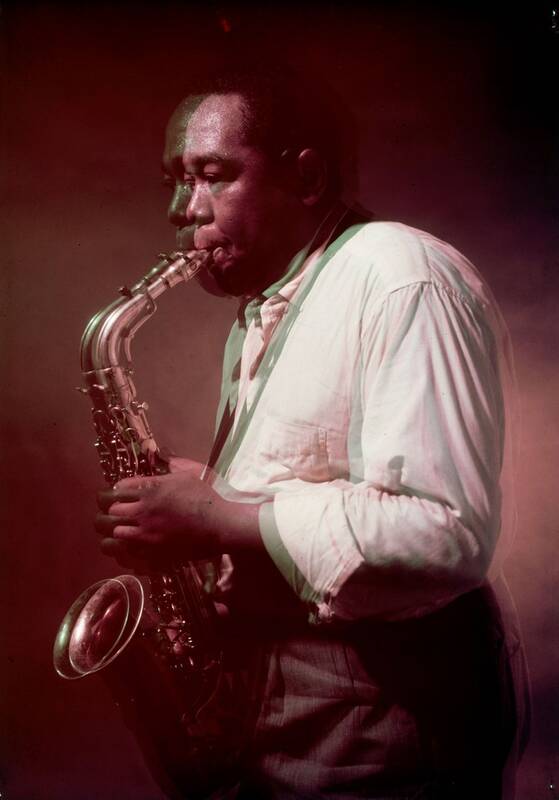 The emcee didn’t even announce his name [and] I didn’t learn that it was Charlie Parker until after the war.” The effect of a McShann broadcast on the black members of Charlie Barnet’s band, backstage at a Newark theatre they were working, was no less electric. They heard somebody play ten spectacular choruses of “Cherokee,” and when their show was over they rushed to the Savoy, found out who the soloist was by asking McShann to play the tune again, and took Parker out to dinner. Parker quit McShann in 1942, and, after a period of rootlessness and semi-starvation in Harlem, joined Earl Hines’ big band, a crazy, warring group made up of old-line musicians and young beboppers. He then passed briefly through the short-lived big band led by Billy Eckstine, and by 1945 had settled down with the many small bands he would lead and/or record with until his death. Astonishingly, Parker’s wild excesses never seemed—at least until the very end of his life—to interfere with his music. It is now generally agreed among jazz musicians that drugs dislocate and dilute their improvisations, but the reverse seemed true with Parker. The only times he could not function were when he was strung out and needed a fix. His style had matured completely by the time he began recording for Savoy. Parker’s playing did not spring magically into being. Other musicians had a hand in its creation. When he was a teen-ager, Parker bathed night after night in the unique, rocking music of Kansas City. No matter where he went, he heard the blues—the heavy, sad, windblown blues of Hot Lips Page, Pete Johnson, Big Joe Turner, Herschel Evans, and Buddy Tate, and the light, rolling, new-coin blues of Count Basie and Lester Young. Young became his idol, and when Parker first went on the road he took along all Young’s records and committed his solos to memory. Parker also worked with Buster Smith, a saxophonist whose style bears a speaking likeness to Parker’s early playing. Parker picked up technical advice from a well-trained local bandleader, Tommy Douglas, and when he got to New York he studied Art Tatum, who unwittingly showed him how to play at lightning speeds, how to peel off sixty-fourth-note arpeggios, and how to devise wholly new harmonies. Some of his early wingings into the unknown were disastrous. When he was sixteen or seventeen, he brazened his way onto the bandstand during one of the tough, endless Kansas City jam sessions, and, trying some fancy stuff in a roaring “I Got Rhythm,” lost his way. The drummer, Jo Jones, stopped playing, grabbed a cymbal, and threw it on the floor at Parker’s feet: he had been “gonged off” the stand. But it is from such embarrassing acorns that Parkers grow. Parker had a unique tone; no other saxophonist has achieved as human a sound. It could be edgy, and even sharp. (He used the hardest and most technically difficult of the reeds.) It could be smooth and big and sombre. It could be soft and husky. Unlike most saxophonists of his time, who took their cue from Coleman Hawkins, he used almost no vibrato; when he did, it was only a flutter, a murmur. The blues lived in every room of his style, and he was one of the most striking and affecting blues improvisers we have had. His slow blues had a preaching, admonitory quality (“Parker’s Mood,” “Barbados,” and “Blue Bird”). He would begin a solo with a purposely stuttering four- or five-note announcement, pause for effect, repeat the phrase, bending its last note into silence, turn the phrase around backward and abruptly slip into double time, zigzag up the scale, circle around at the top, and plummet, the notes falling somewhere between silence and sound. (Parker was a master of dynamics and of the dramatic use of silence.) Another pause, and he would begin his second chorus with a dreaming, three-note figure, each of the notes running into the next and each held in prolonged, hymnlike fashion. He would shatter this brief spell by inserting two or three short arpeggios, disconnected and broken off, then he would float into a loafing half time and shoot into another climbing-and-falling double-time run, in which he would dart in and out of nearby keys. He would pause, then close the chorus with an amen figure resembling his opening announcement. Parker’s medium-tempo blues had a glittering, monolithic quality, and his fast blues were multiplications of his slow blues. All of them contained an extraordinary variety of emotion. He cajoled, he attacked, he mourned, he sang, he laughed, he cursed. Perhaps his reliance on drugs and booze was an instinctive attempt to replenish his creative well, for every solo was a free and wondrously articulated giving of himself. But there was another, quite different Parker—the Parker who played slow ballads, such as “Embraceable You” and “Don’t Blame Me” and “White Christmas.” Here he went several steps further than he did with the blues. He literally dismantled a composer’s song and put together a structure ten times as complex. New chords and harmonies appeared, along with new melodic lines that moved high above the unsounded original. (He would, though, always inject pieces of the melody as signposts for the listener.) He could do anything he liked with time, and in his ballads he lagged behind the beat, floated easily along on it, or leapt ahead of it; he did things with time that no one had yet thought of and that no one has yet surpassed. His ballads were dense visions, glimpses into an unknown musical dimension. Although they were perfectly structured, they seemed to have no beginnings and no endings; each was simply another of the visions that stirred and maddened his mind. Thus his 1947 version of “Embraceable You,” which, so brief, so intense, so beautiful, remains one of the monuments of music. (There is just one Parker ballad of this sort on the Savoy reissue—“Meandering”—and it is incomplete.) Parker’s fast thirty-two-bar tunes were meteoric (“Ko Ko,” “Constellation”). He used multitudes of notes but never a superfluous one. His runs exploded like light spilling out an opened door. His rhythms had a muscled, chattering density. He crackled and poured and roared. Parker turned the world of jazz around, and the effects are still felt. One hears him in the work of such saxophonists as Charles McPherson and Phil Woods and Sonny Stitt and Sonny Criss, and less openly in the playing of Sonny Rollins and John Coltrane and Ornette Coleman. One hears him in almost every guitarist, pianist, trumpeter, bassist, drummer, and trombonist over forty, and he is still audible in the instrumentalists of the present generation, although most of them may not know it. But Parker’s legion of admirers have, by and large, missed his main point. He widened the improvisational boundaries of time and harmony and melody, but he did not reject what had come before, for at bottom he was a conservative, who found new ways of expressing what King Oliver and Louis Armstrong and Sidney Bechet had said earlier. His admirers donned his form and ignored his content. Countless players appeared who used a thousand notes in every chorus, who had hard, smart tones, and who indulged in fancy rhythmic patterns. Yet they sidestepped the emotions that governed all that Parker played. The ironic results were the hard-boppers of the late fifties and the cul-de-sac avant-garde of the early sixties. Fortunately, most of this happened after he was dead, and he did not suffer the horrors that Lester Young endured during the last decade of his life—the musical claustrophobia of hearing yourself again and again in the work of almost every young saxophonist and of knowing, at the same time, that your own powers have shrunk to the point where the new men sound more like you than you do. For a time after his release from the hospital in California, Parker cooled it. But the pace of his life quickened again, and by the early fifties it had gone completely out of control. He collapsed on the street, he got into horrendous fights, he tried to commit suicide. He slept, when he slept at all, on floors or in bathtubs or in the beds of friends. He cadged drinks, and he panhandled. His horn was usually in hock, and he missed gigs. And at last his playing faltered; he began to imitate himself. One reason was physical; he no longer had the stamina to sustain his extraordinary flights. The other was more subtle. Like Jackson Pollock, he felt that he had reached the end of his explorations. The blues and the thirty-two-bar song no longer were challenges. He had, he thought, discovered every chord change, every rhythmic turn, every adventurous harmony. He talked of writing big orchestral works, and he considered studying with the composers Stefan Wolpe and Edgard Varèse. But there were blazing exceptions to his faltering, and one of them was a concert given in May of 1953 in Massey Music Hall, in Toronto. (A recording of the entire evening has been reissued by Prestige as “The Greatest Jazz Concert Ever.”) On hand with Parker, who arrived without a horn and had to borrow one, were Dizzy Gillespie, Bud Powell, Charles Mingus, and Max Roach. Parker had long had ambivalent feelings about Gillespie. He admired him as a musician, but he resented Gillespie’s fame—the story in Life about Gillespie and bebop, in which Parker was not even mentioned; the Profile of Gillespie written for this magazine by Richard O. Boyer. In addition to being a handy businessman, Gillespie is an accessible, kind man. He has long had life in focus. Parker was the opposite—a closed, secret, stormy, misshapen figure who continually barricaded himself behind the put-on. (Using his deepest voice, he announces on the record that Gillespie’s “Salt Peanuts” is by “my worthy constituent.”) Gillespie was a challenge that night, and so was the rhythm section, which played with ferocity and precision. Parker responded, and in “Wee,” “Hot House,” and “Night in Tunisia” he soloed with a fire and a brilliance that match anything in his earlier work. Parker’s death was an inevitable mixture of camp, irony, and melodrama. He had been befriended by the Baroness Pannonica de Koenigswarter, a wealthy, intelligent eccentric who lived in the Stanhope Hotel and drove herself to jazz clubs in a silver Rolls-Royce. Her apartment had become a salon for musicians. In March of 1955, Parker secured a gig at George Wein’s Storyville, in Boston, and on his way out of New York he stopped at the Stanhope to say hello. The Baroness offered Parker a drink. To her astonishment, he refused, and asked for ice water. His ulcer was acting up, and cold water would, he said, quench its fire. Suddenly he started vomiting blood. The Baroness’s doctor examined him and said that he would have to go to a hospital at once. He refused, so he was put to bed in her apartment and given antibiotics. Several days passed, and he seemed to improve. On a Saturday night, he was allowed to sit in the living room and watch Tommy Dorsey’s television show. He was in good spirits. During a juggling act involving bricks, which he remembered having seen in Kansas City as a child, he started laughing, choked, and slumped in his chair. He died a minute or two later. At that instant, according to the Baroness, she heard a single huge clap of thunder. The official cause of death was lobar pneumonia, but Parker had simply worn out. The tenor saxophonist Buddy Tate had run into Parker not long before. “I first knew him in Kansas City in the thirties, when I was with Andy Kirk,” he said a while ago. “He hadn’t gotten himself together yet, but he was admiring Buster Smith, who always played Kansas City style. When he first came to New York, we’d hang out together some. He didn’t have any work, and nobody knew who he was yet, but he’d be up at Clark Monroe’s Uptown House every night. I’d have him over to the house, and my wife would put on a pot, but he would never eat. I tried at the time to get him into Basie’s band, but Basie wouldn’t have him, and he never forgot that. But he was always nice and kind and soft around me. I never saw him mad at anybody. “One morning a week before he died, I was walking along Forty-second Street toward Grand Central. It was about ten o’clock, and I’d been on some sort of big-band record date, just playing clarinet. I saw this man way down the sidewalk, and it was Bird. He was hard to miss, with those out-of-style suits that didn’t fit, and those big old wide granddaddy suspenders he always wore. When I got close, I saw he was all swollen up. I knew he’d been very sick and in the psychiatric part of Bellevue.